She's got a ticket to ride. From Gijon back to Santilliana del Mar. 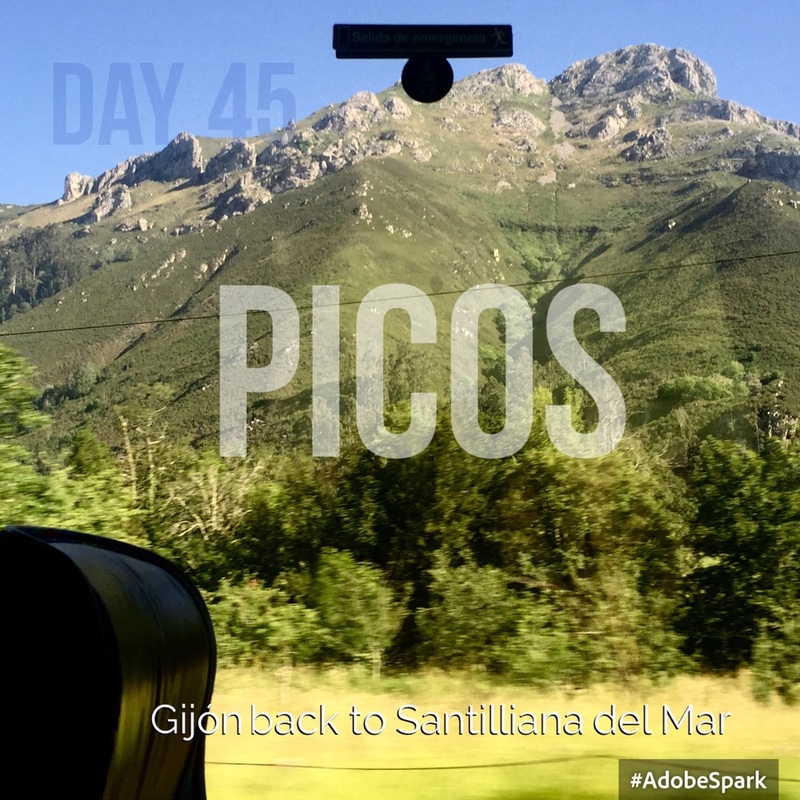 It took 3.5 hours by bus to retrace my step with spectacular scenery as we wind through the Picos mountains with snow capped mountains in the distance. I recognise the towns I pass through and muse: "that's where I bought my picnic" or "I walked down that street" and feel like a spectator of my own life. I arrive at the modern town of Torrelevega at 12.45 and receive a text from Dad and Linda to say that they have arrived. So I do a very un-pilgrim thing and... jump in a taxi! Actually I share a taxi with an elderly couple who are going to visit someone in the hospital and 10 minutes later I'm back in the cobbled and honey coloured streets of Santilliana del Mar, which is as quaint as before. The Parador Santilliana is luxurious and very beautiful and I'm waiting in the front courtyard with my backpack as Dad and Linda walk in. Wonderful and miraculous to meet here in such a beautiful place. The carpark is full of posh GB cars - so this is where the Brits are! So after settling in and marvelling at the soft towels, crisp sheets and our respective balconies, we venture out to find lunch. The Menu del Dia is very good at the Restaurant de Villa and comes with a good bottle of white Rioja. Then we wander round the town and decide we need a siesta. Walking the Camino is not a holiday, but this certainly is! At 6pm it's time to visit the wonderful church of St Juliana again, with its wonderful Romanesque cloisters. The sidra tasting was less of a success- I think it must be an acquired taste and I have. A little tapas for supper and then it's time to test out the free toiletries and the cotton sheets. No need for the bed bug sheet here!